The Royal guard has only a silly little hut while the King has a whole block of rooms. I wonder what the guard is doing - is he sending a SMS to his colleagues? "Come quick. I need to go to the ...."
Certainly looks like he does just that. I guess the Swedish Royal Guard are not as strictly regulated as the ones at the Buckingham Palace in London. Either way, the job must be pretty boring. The entire guarding duty is rather odd for all sorts of reasons, including the fact that the owners moved out of town decades ago. 1. The royal guard at Buckingham Palace are employees, but in Sweden the royal guard represents by the men and women who do there military service. Otherwise he do something else, like shoot a maching gun, drive a tank, building bridges, you name it. All units in the Swedish military defence does the "högvakt", royal guard for about two weeks, then they shift with another unit and so on all year around. 2. The royal family lives in Drottingholm Palace, but there is a royal guard there too. 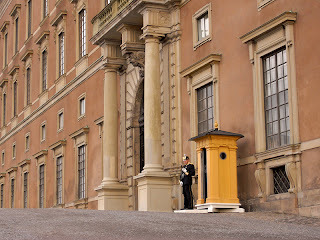 The reason for guarding the Royal Palace in Stockholm is obvious; the regalia, art, and the palace itself. 3. Doing the royal guard is boring. Been there done that! You stand there for two hours and look at the same building, counting the stones in the ground, for two weeks! No one wants to do that, everybody are suposed to do something else, as i wrote. But you have a good point Anders about the difference between being an employee and not having chosen to stand there in the first place!